Trees in all their varieties and forms put on a stunning show for us with their gorgeous shades of reds, oranges, and ochres. Walking in the damp, misty air surrounded by such changing beauty is a brief pleasure at this time of year and should be savoured for all that it is. Then, return home from such woodland rambles with ruddy cheeks and pockets full of shiny conkers to be stashed in corners to keep the spiders at bay! The image of the tree is a restful one and has so often been represented in art and poetry but it’s also a popular motif in interiors. From fabrics to wallpaper you can dress your windows and walls with mighty oaks and woodland scenes. Lewis & Wood’s (www.lewisandwood.co.uk) Royal Oak, 56% linen & 44% cotton, w.137cm, £88.80/m is a stunning large scale woodcut print. It makes for a bold but elegant fabric, “Featuring the towering spire of St Mary’s Church Tetbury, the River Avon and bird and animals, it is a striking and beautiful contemporary Toile which depicts a bucolic tableau of country life”. Royal Oak comes in two seasonal colourways, Spring and Autumn. 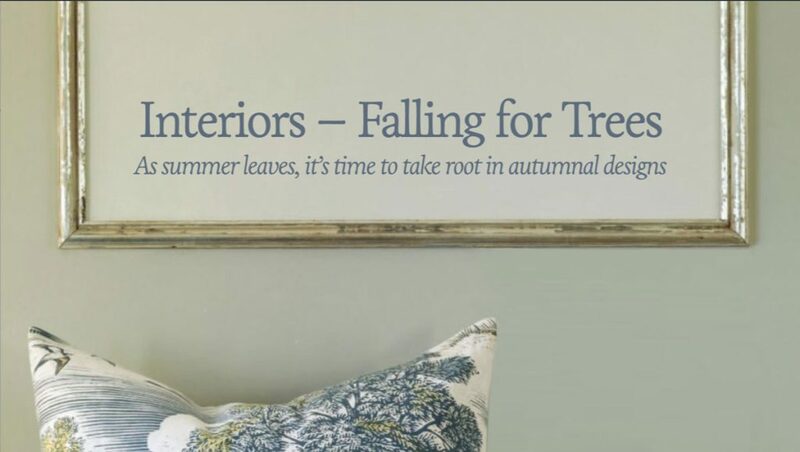 For your walls, Osborne and Little’s (www.osborneandlittle.com) Richmond wallpaper, W5870-02, 10m roll, £70.00/roll is available in four colourways and is a clean, pared-back design of silhouetted trees whose leaves have already fallen in the wind. William Wordsworth wrote, “Wild is the music of autumnal winds, Amongst the faded woods” and this wallpaper is certainly reminiscent of a faded wood and beautiful in it’s simplicity. Alternatively, Sanderson’s (www.sanderson-uk.com) Woodland Toile wallpaper DW0W215716-19, £54.00/roll “…creates the atmosphere of being in the middle of a wood with a typical variety of Native woodland trees”. This detailed design was drawn in pen and ink and would provide a contemporary but naturalistic background to your space. So by dressing your home with beautiful materials such as these you can still enjoy the restful presence of our native gentle giants whilst outside nature turns and falls for another season.